Microsoft Tuesday previewed a new webmail service called Outlook.com that will soon replace Hotmail. The company hopes that new features built into the web-based Outlook client will draw web users away from competing services like Gmail and Yahoo. Outlook.com inbox with the reading pane open. Hotmail has fallen far: Nearly a decade ago, it was sitting on top of the webmail heap. However, as Google ramped up Gmail, and as Yahoo also joined the fray, Hotmail seemed to lose its way during its many attempts at redesign and at least one rebranding as Windows Live. Outlook.com is an attempt to gain that mojo back. The Metro interface makes an appearance and with it comes a much cleaner interface. The result is a 30-percent increase in the number of viewable messages, according to Microsoft. The company also is doing away with large display ads, an obvious shot at its competitors. “We realized that we needed to take a bold step, break from the past. and build you a brand new service from the ground up,” Outlook team member Chris Jones wrote in the Microsoft Outlook blog. Outlook.com inbox with Skype dialogue box. Another big feature of Outlook.com is social networking integration. Instead of the standard e-mail inbox, users will be able to view status updates and content from Facebook, Google, Twitter, and LinkedIn. 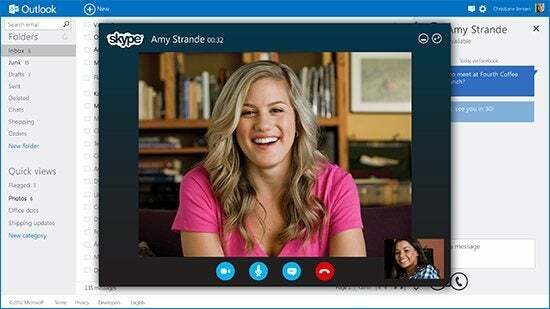 Microsoft also plans to enhance Outlook.com with Skype, which would give it similar functionality to the Google Talk features found in Gmail. 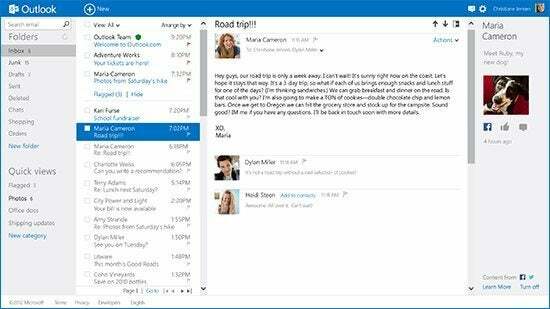 Outlook will automatically sort these social updates into various categories, Jones says, in addition to automatically detecting message types, such as shipping updates, newsletters, and important e-mails from your contacts. Outlook also includes free web-based versions of Word, Excel, PowerPoint and OneNote, and additional storage space for attachments will be provided through its SkyDrive service. While Microsoft’s e-mail service may be changing, your e-mail address will not. An outlook.com e-mail address will be available to those who request it or sign up through the preview. However, longtime Hotmail users can keep their @hotmail.com, @live.com, and @msn.com addresses, as well as their own contacts and settings when using the new service. So will Outlook.com succeed where Hotmail and Windows Live failed? It may be a bit too early to tell. That said, the new webmail service certainly takes into account the changes in our online lives. Ten years ago, web-based e-mail served its purpose because that was how we communicated online. Shouldn’t a modern webmail service take into account the fact that e-mail is only one of many ways Internet users communicate these days? Microsoft sure thinks so.